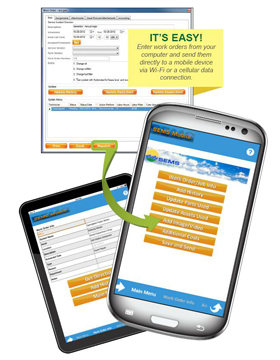 SEMS Mobile – Work Order directly integrates into your Asset Management System by electronically “dispatching” the work order to the field technician’s device via Wi-Fi or a Cellular connection. Technician’s will receive the work order immediately giving them the ability to review, complete, and submit it back to SEMS eliminating the need of administrative paperwork. If the technician sees an item that requires a work order it can be created in the field. No internet connection? No problem, the system securely stores your data on the device until the technician returns to a connected location. Connectivity & Compatibility: Connectivity is only needed to receive and send work orders since they are directly stored on the device. This gives you the ability to run either Cellular or Wi-Fi ONLY. Device options are either smartphones or tablets running the Apple iOS™ or Android™ operating systems. Dispatch: Work orders can be received on your device either immediately in the field via cellular data plan or synced once you have connectivity through Wi-Fi. Upon receipt, technicians have the ability to review, complete, and submit work orders back to SEMS. After submission, completed work orders will be updated automatically in SEMS. Field: Technicians have the ability to create their own work orders directly from their field devices. These work orders can be sent in for supervisors/management for approval or completed immediately out in the field. Mobile Forwarding: Technicians have the ability to forward work orders to other technicians to assist with multiple step projects. Work orders come back to SEMS each time it is forwarded, updating the software with history details. Auto-Dispatching: Automatically dispatch work orders to technicians based on the scheduled date. SEMS Mobile – Benchsheets streamlines your sample collection process and go PAPERLESS. Customized benchsheets are built to your current workflow process, since we understand that no two systems are the same. Eliminate the need for double-entry by collecting your data out in the field. Forms are automatically uploaded and stored in SEMS from technician’s smartphones or tablets. Connectivity & Compatibility: Connectivity is only needed to receive and send benchsheets since they are directly stored on the device. This gives you the ability to run either Cellular or Wi-Fi ONLY. Device options are either smartphones or tablets running the Apple iOS™ or Android™ operating systems. Mobile Form: Forms are configured to your Drinking Water and/or Wastewater system. Results are entered directly on smartphone/tablet and sent back to the office by either Wi-Fi or Cellular data plan. The forms are automatically uploaded using SEMS Connect. Trending: Ability to review historical results trending by either a table or graph. Tables provide calculation of prior results/readings, its difference and percent difference. A graph provides a line-graph of the historical results/readings.